AA Diarstop is a supplement and can reduce absorption disorders and acute loose stools in dogs and cats. Please note: For cats and dogs under 25 kg we have Finidiar Paste available. AA Diarstop is a supplement and reduces absorption disorders which lead to acute loose stools and provides a protective layer on the intestinal mucosa. AA Diarstop contributes to a normal and natural bowel function and supports dietary measures. The composition has been adjusted and AA Diarstop now also contains probiotics. Each tablet contains: kaolin, aluminium hydroxide, sodium chloride, calcium, potassium, magnesium, and flavouring. Always administer orally, either place directly in the mouth or mix with food. AA Diarstop: 1 tablet per 10 kg of body weight, twice daily for 2-3 days. 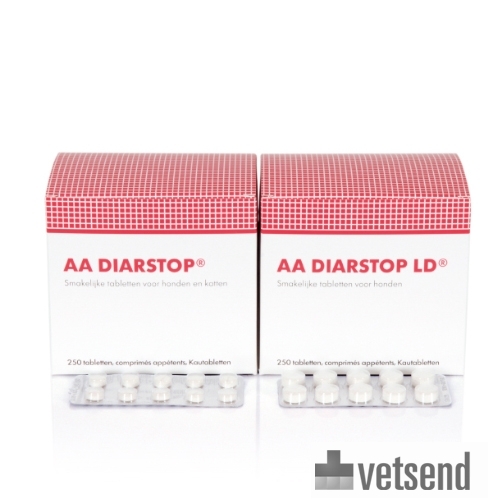 AA Diarstop Large Dog: 1 tablet per 25 kg of body weight, twice daily for 2-3 days. Storage: At room temperature (15 - 25ºC) in a dark, dry place. Keep away from children. These products are purchased in large quantities and shipped per order. As a result, the products are shipped without the original packaging and leaflet. For the dosage, administration and other relevant information, please visit the product page for the relevant product. Should you have any further questions, please contact our veterinarian by phone or using the contact form. Have you used AA Diarstop before? Let us know what you think about this product. Greatly improved my dog's diarrhoea situation!